If you’re looking for a place to grab a burger that’s not on 13th Avenue and doesn’t have a value menu, this is the guide for you. There’s nothing wrong with a McDonald’s or Jack in the Box burger now and then. You’re a college student — sometimes you need something quick and cheap. But every once in awhile, you’ve got to treat yo’ self. That’s where this guide comes in. These are some of the best places to grab a burger in Eugene (and sometimes a brew while you’re at it). We’ll cover two different types of Eugene shops: Joints dedicated to perfecting their craft between two buns and restaurants that offer a variety of menu items but have a strong burger game. Apologies to Caspian, Rennie’s, Taylor’s and Webfoot. You’ll find this place right under the Skybox and Courtside apartments off Franklin Boulevard on Orchard Street. The name pretty much tells you what you’re in for. But you know what they say: Big things come in small packages. These are still quarter-pound patties — they’re just packed together to look much smaller. Don’t make the same mistake as one particular Emerald reporter and order four of them just because they look — as he said at the time — “like nothin’.” These tiny burgers pack a wallop. Yeah, we know it’s a chain. But it’s not like we’re sending you to Burger King or anything. Five Guys has two locations within driving distance of the UO: One in West Eugene and another near Gateway Mall in Springfield. In addition to burgers, Five Guys has a decent offering of hot dogs. One of the chain’s gimmicks — not that anyone’s complaining — is that there’s a bottomless well of peanuts situated near the cash register to give you something to do in the event of a woefully long line. There’s one way to avoid the wait: Order online. Killer Burger may be the newest joint on this list, but don’t mistake that for amateurism. It’s part of the wave of businesses that are transforming downtown Eugene into a little slice of Portland (That’s where the chain got its start). What separates Killer Burger from the rest of the pack is its use of patties that are 1/3 pound. Oh, and did I mention that the bacon is free? That and a full bar makes this a favorite for the over 21 crowd. Don’t forget to try the Peanut-Butter-Pickle-Bacon Burger. Trust me. This locally-owned chain is a spinoff of the Mucho Gusto Mexican food joints, which also includes a frozen yogurt place on Valley River Way and a barbecue restaurant on 13th Avenue (Bill and Tim’s, also run by the same company, Westraunt Concepts). Although there’s now only one Dickie Jo’s next to the Valley River Center —there were once three — it’s still worth a visit. What makes Dickie Jo’s special is the garlic fries that come with only a minor upgrade charge. Aside from that, they just make a damn good burger. And there’s coffee right next door. Burger and brew: Mondays. $11.99 for any burger on the menu and your choice of beer. This place is not for the claustrophobic. Cornucopia excels in ambiance. The place is seldom empty and it’s pretty easy to see why: The folks in the kitchen come up with some of the most inventive burgers you’ll find in Eugene. Wild Bill’s Bacon BBQ Burger isn’t just a mouthful, it’s probably one of the tastiest things you’ll encounter in your time here. Like most places, you’ll find an inventive appetizer menu with a myriad of options for fries. The great thing here is that you can always order a pound of seasoned potatoes. Burger and brew: Tuesdays. $8 for any burger on the menu and your choice of beer. Die-hard Duck fans will feel right at home here. The walls are decked with Oregon memorabilia, from jerseys to banners and everything in between. The centerpiece is a wooden scoreboard that shows the Ducks running up the score against the Fuskies (Because huck those guys, amirite?) This place is also in a great location. The Hult Center is right across the street, making this a prime place to go after a performance. Sixth Street might just be the hardest on your wallet (Most appetizers come in at around $10), but you won’t be thinking much about that once the burgers come. Burger and brew: Mondays. $10.50 for a six-ounce burger and your choice of McMenamins ales. If you lived in any sizable town or city in Oregon, chances are that you’ve been to McMenamins. But that also means you know each site has its own unique flair. The Eugene locations are no different. The High Street shop is a bit smaller and cozy with a big outdoor area. The North Bank location is situated right on the Willamette — if you’re looking for a great outdoor space on a spring day, look no further. The 19th Avenue shop offers pool, shuffleboard and a larger indoor area. As always, Cajun tots are the perfect way to start the meal no matter where you are. Although it’s the only place on this list without a burger and brew deal, what Agate Alley lacks in an adult combo meal it more than makes up for with great drink specials. 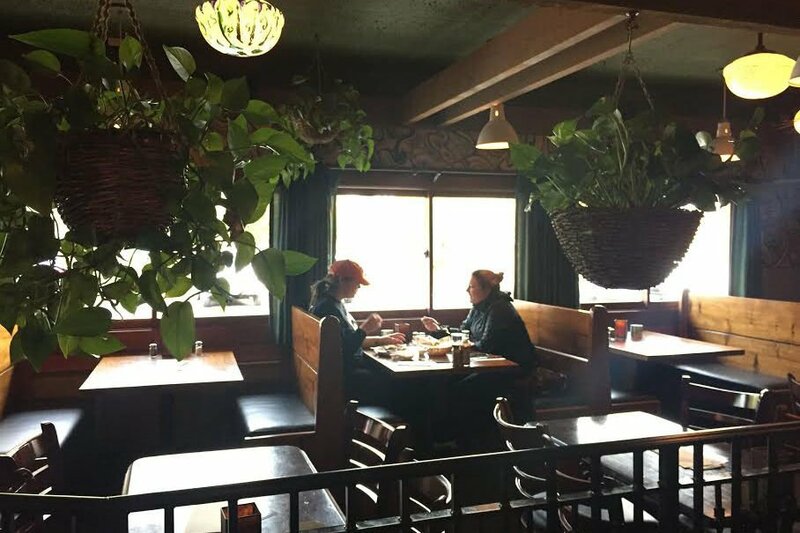 If you’re looking for a quieter, more spacious atmosphere, ask for a table in the back. The bar sits at the front of the restaurant, and every Thursday it’s the site of the Drink Wheel: The staff spins it every half hour to indicate a different $3 special. Flaming Dr Peppers? Irish Car Bombs? They’re all here. And Wednesdays you get econopints: Every beer on tap is $2.50.